The World Crime Convention – better known to convention fans as the Bouchercon, was recently held in Albany, New York. This convention is for fans of all the sub-genres of mystery, be they thriller, police procedural, traditional, oriented! I was there to scope out participants whose books were picked for our 2014 mystery discussion books – and to see who might be interested – and interesting! — to consider when our planning meeting comes up next year. I’m thrilled to share that Chris Pavone was there, and has agreed to call-in and join our discussion of his book The ExPats in 2014! 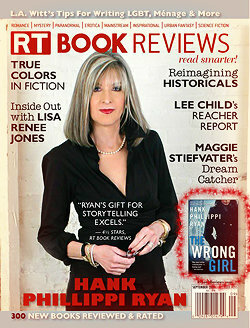 Chris had some great news of his own at this Bouchercon – he won the Anthony award for Best First Novel for The ExPats ! In terms of seeing favorite authors & friends, I got to spend time chatting with Lisle Library friend Zoe Sharp, and found out that she has a stand-alone that’s just out recently (and that we are ordering!) 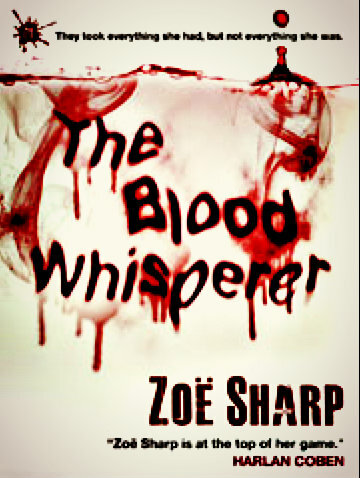 It is called The Blood Whisperer and features, as quoted from Amazon “the uncanny abilities of London crime-scene specialist Kelly Jacks” with a plot that promises to be typical Zoe: un-put-downable! The tag line’s a bit hard to read: “They took everything she had, but not everything she was.” – Makes me want to read it! I took before the panel started. They were having a bit of fun with just who is who. (So the mystery will be solved for you, they are (from left to right): Rhys Bowen, Debbie Crombie, and Louise Penny. As with Chris Pavone, Louise also got wonderful news at the Anthony awards – she won Best Novel for The Beautiful Mystery ! The last quick news I have to share with you is that I was successful not only in adding W is for Wasted to my Kinsey Milhone collection, but getting a picture taken with the wonderful Sue Grafton who was Bouchercon 2013’s Lifetime Achievement Award winner. What a way to end a con! 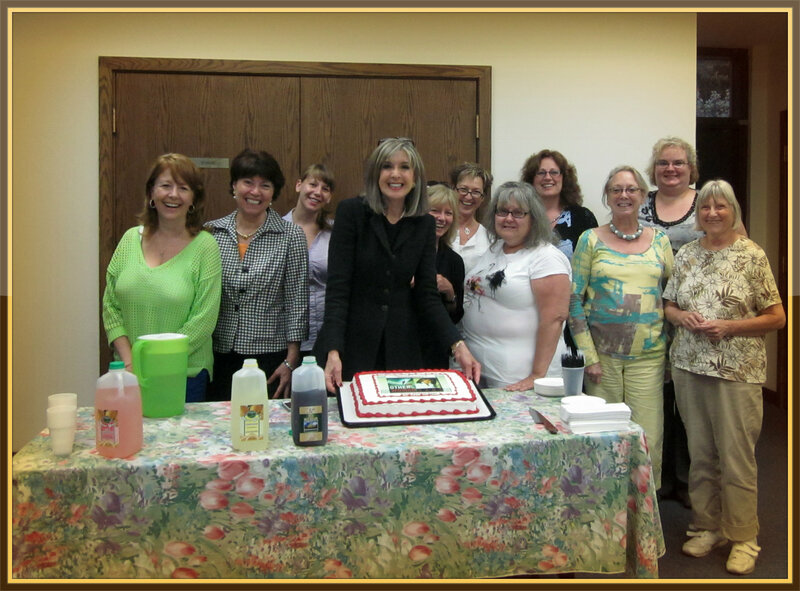 Pix With Our Special June Visitor: Hank Phillippi Ryan! 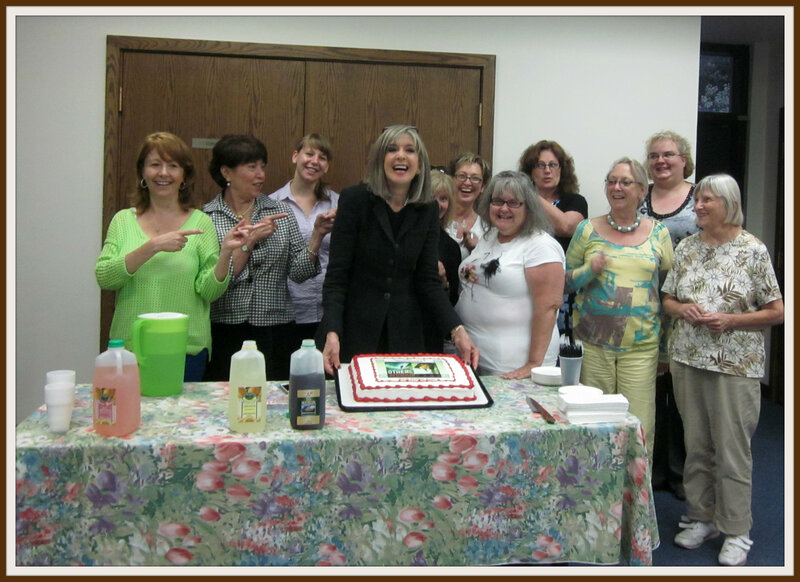 Murder Among Friends had an outstanding visitor who came to join our discussion of her book. 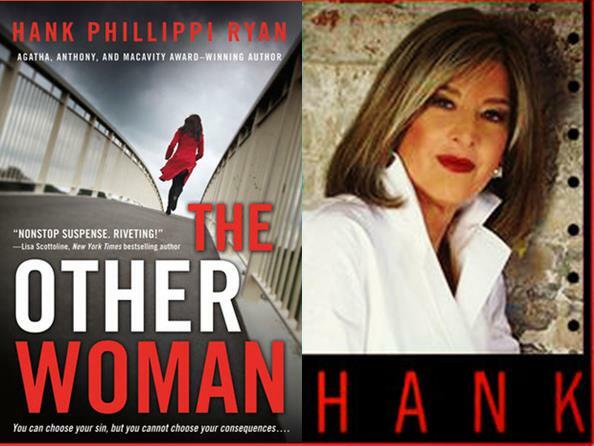 At our June discussion of The Other Woman, Hank Phillippi Ryan came, saw, and conquered us with her warmth, inclusiveness and fascinating insights to what the life of an investigative reporter is really all about, and her transition into award-winning mystery author. 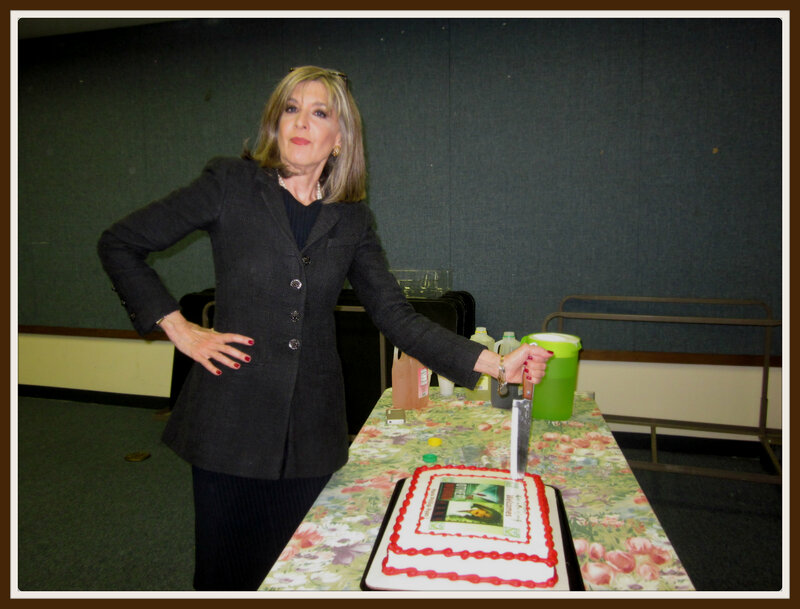 We also think that she ably demonstrated her unique take on how to “Stake the Cake” that we handed out while she signed copies of her books for attendees. A great time was had by all as the pictures below will prove! Another beautiful cover cake from Lisle Jewel! .. And then pointed a finger at their choice of suspect for The Other Woman we like best. 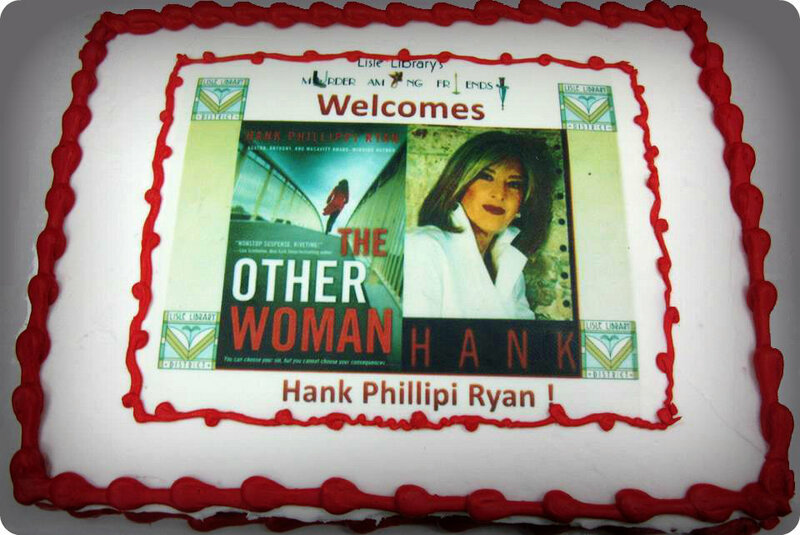 In which Hank not only “Stakes the Cake” (a MAF photo op fave) – she takes it too! Veddy well done.